↑ Bencze, Mihály; Wu, Hui-Hua; Wu, Shan-He (2008). "An equivalent form of fundamental triangle inequality and its applications" (PDF). Research Group in Mathematical Inequalities and Applications. 11 (1). ↑ Dospinescu, G.; Lascu, M.; Pohoata, C.; Letiva, M. (2008). "An elementary proof of Blundon's inequality" (PDF). Journal of inequalities in pure and applied mathematics. 9 (4). ↑ Blundon, W. J. (1963). 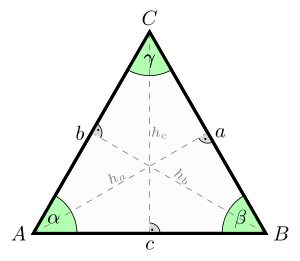 "On Certain Polynomials Associated with the Triangle". Mathematics Magazine. 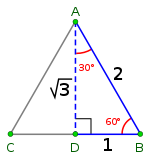 36 (4): 247–248. doi:10.2307/2687913. ↑ Alsina, Claudi; Nelsen, Roger B. (2009). When less is more. Visualizing basic inequalities. Mathematical Association of America. pp. 71, 155. ↑ 5.0 5.1 Pohoata, Cosmin (2010). "A new proof of Euler's inradius - circumradius inequality" (PDF). Gazeta Matematica Seria B (3): 121–123. ↑ McLeman, Cam; Ismail, Andrei. "Weizenbock's inequality". PlanetMath. Archived from the original on 2012-02-18. ↑ Yiu, Paul (1998). "Notes on Euclidean Geometry" (PDF).